A weekly newspaper will no longer be based in the town it serves after its base was shut as part of Johnston Press’s programme of office closures. The Hucknall Dispatch has been based in the Nottinghamshire town for more than 100 years but its Yorke Street building closed its doors for good on Friday. Staff are moving across the county boundary with Derbyshire to work at the offices of sister title the Ilkeston Advertiser, eight miles away. A story in this week’s paper said regular surgeries would be held in Hucknall by the news team and a ‘community postbox’ would be based at a local newsagents for people to drop off adverts and family notices. 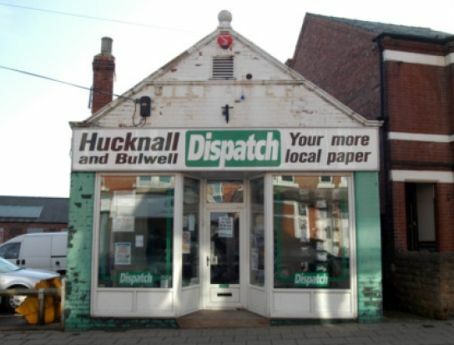 The offices of the Hucknall Dispatch, which have now closed. It is the latest of a string of newspaper office closures by Johnston Press which are being made so the company can release funds to ensure its remaining buildings are “fit for purpose” and pay down its £350m debt. The Dispatch’s story said journalists would be based in the community more and details of its reporter surgeries would be printed in the paper each week. It added that membes of the public could also visit reporters at their new base in Ilkeston. Last month, Johnston Press announced the closure of five newspaper offices in South Yorkshire, Derbyshire and Nottinghamshire. The company said it would shut the main offices of the Matlock Mercury, Ripley and Heanor News and South Yorkshire Times in Mexborough, along with two satellite offices of the Mansfield Chad in Mansfield town centre and Sutton-in-Ashfield. Johnston Press chief executive Ashley Highfield has defended the office closures, saying the aim was to release funds to improve the remaining offices and ensure staff have the technology they need to work remotely. The company has not yet responded to requests for a comment on the closure of the Dispatch office. I love the slogan on the front of the office. This is presumably now: “Your less local paper”. This idea of reporters spending more time out in the community is being touted as thought it were something new. Although the reasons behind moves of this kind are dubious, getting closer to the public again is to be welcomed in principle. When I started on a weekly not a million miles from Hucknall, we were expected to spend many hours ‘doing the calls’ in the small towns and villages we served. In fact, with courts, daytime council meetings and other events that we actually attended, the only time we were expected to be seen in the office was when we were writing up and on press day. All on public transport (or a bike). A mobile phone would have been handy, not to mention a laptop and email. And I thought we worked in a ****hole at Northampton ! How ridiculous to close the dispatch office – it won’t be long before there is no Dispatch anymore. As I understand it, there’s now only one person putting the entire Dispatch together which is ridiculous in itself, though I assume it’ll now be spread around other already over-worked journalists in its new home and beyond. If the picture is anything to go by, the paper clearly needed a new base, though one in a neighbouring county probably wasn’t what was expected. Actually, Billy Bewildered, that photo just shows that despite huge JP profits over the years, none has ever been ploughed back at grass roots level, management instead feathering their own over-padded nest. If that photo is anything to go by it really illustrates how much trouble Johnston is in. If the company can’t even keep a little premises like that going….